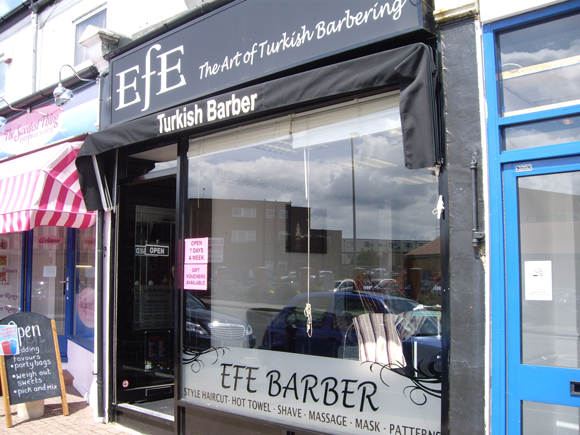 Efe Turkish Barbers offers the art of Turkish barbering. Their services include; hair cutting and styling, hot towels and masks to care for your complexion, massaging to aid relaxation and shaving. G, and C.J and all the team at EFE are first class!! Never known a better barbers. I went there the first time on the off chance I could get a quick cut, after being told by other hairdressers in the town (who had no customers) that I had to have an appointment, and have never looked back since. I don’t recognise the views put across in the negative posts. Fast, efficient and spot on. Well worth the money, and like others they deserve the tip they get from me every time I’m there. Of interest I always get offered a turkish tea or coffee, which is good service as far as I am concerned. The shave is great bit of relaxation if life is getting a tad hectic! 5 very big stars!!!! The worst hairdressers Ive ever been to. Went there once about 7 months ago and the guy did not listen to me one bit, he just said yes yes and nodded his head and chopped away, I ended up looking like a gay woman I was quite upset. The other day I tried them again in the hope that a different cutter there would do better but once again did not listen and I have some long bits and some short bits, the back of my head looks like a peacock its just really bad, as the previous person this cutter did not listen to me at all. The problem is with Efe is they are so cocky and sure of themselves they think it doesnt matter what you really want because they will just do a good cut anyway, Im half turkish myself and this is not how turkish people cut hair. If you take pride in your hair at all DO NOT GO THERE. it’s all good wen the boss is there.but wen he’s not in the shop it’s s*** and rushed with turkish muppets standing about i went in for a simple no.3 and beardtrim.one day its £12 if the boss is away its £16.that guy with the chair at the window is s***. Barber Shop in Hadleigh provides a top quality service whether you want a clip, cut or shave.